On August 27th, Saturday: Guest Artist and Lo-Fi Arts Festival curator Anne Blackburn gave an Artist Talk and hands-on demo of book-carving for her environmental installations. She also shared photos and films from her two-year installation of human-made shelf fungus that has been installed at art mecca Smoke Farm. Anne’s particular focus for the evening was to ask everyone and herself….”when is this project done”? Earlier this summer, just a week before I started Solstenen project, I had a small exciting adventure at Smoke Farm with Anne Blackburn. Smoke Farm has popped up its amazing acreage into my work before; I’ve walked all over the place, made a film, done photoshoots…but it continues to yield hidden places and surprises. Anne took me to one; her two year Shelf Fungus Project. I’d heard about it…seen some pictures floating around, and had missed it at the last Lo-Fi. I always imagine Anne so immersed in her work — which also includes curating and organizing and gathering people together — that she doesn’t really do the full onslaught of ‘marketing’ that seems the norm for our age. And I’m glad…not really knowing all I wanted to know from the computer put me in the position to get Anne to take me on a hike to see her woman-made Shelf Fungus. After a hike down a path I was familiar with, we took a sharp turn towards the mountain and under some evergreen boughs that opened up into a cathedral-like clearing where you can’t see the sky. The most striking element were the many very tall old-growth stumps, with the notches carved a century ago by lumbermen, tool marks still very much visible. Each stump now has a 50 year old ‘new’ tree sprouting out the top, creating this dense canopy, but also very much showing the process that Smoke Farm itself is undergoing; renewal in the form of decay. Once harnessed and used for human industry, the land, the trees, the water – through human care and the unceasing urge of nature to renew – are changing back (or changing forward) to a wild place….or a place that references the wild place it once was and can never truly be again. It was easy for me to see a time-lapse in my mind of the clearing of the land, the farm being built, the cows, the effort, the lives made and past. I could see the trees head to the saw mill and go through a myriad of processes to become any number things to meet human needs, including books. 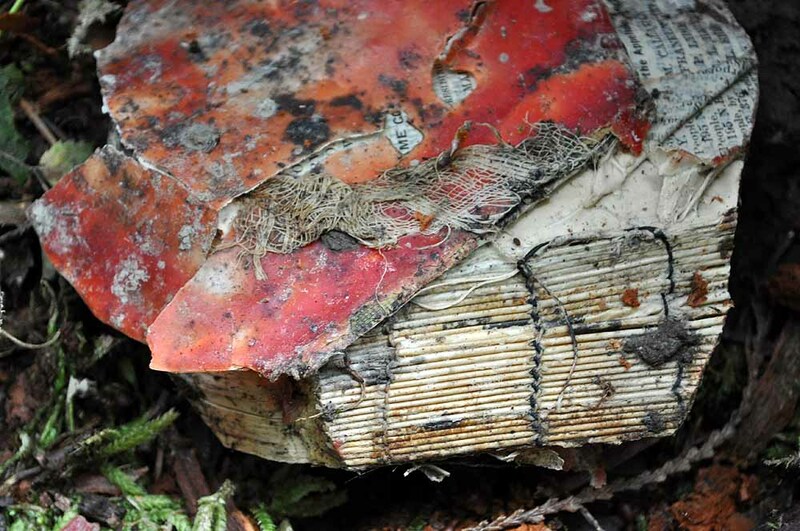 Then in this little village of massive stumps, we see Anne’s human-made Shelf Fungus….made of books. Again, I can see another time-lapse of paper being made, books being bound, and used for half a century — law books about property rights, no less — then discarded when the weight of digesting information in that form became too cumbersome. They became trash. Until Anne Blackburn takes them up, carves them like one would if they were wood (because they are…..) and makes them back into the image of something they once were, a flourishing opportunistic organism, an ecosystem. The tools marks remain, just as they do on the stumps in that old and new forest. Then she sets them back into the forest, to decay and renew at the same time; in private, the only audience the life that goes on around them, and sometimes with human visitors. Anne, an enthusiastic scholar of land art, science and the gathering of human effort, asks‘when is the work done’ ? On hearing that the Fungus project was nearing an end (if there is one…. ), and that there were miles of unedited footage of days and nights passing before a little wildlife camera trained on the Fungus installed, and the incredible overlapping of cycles of destruction leading to creation, leading to destruction leading to creation…some by human industry and need and some by the ever-pervasive natural cycle, I really wanted to learn all I could about this work where the edges seem to bleed over, and share it with everyone through my time at The Project Room. Thanks to all who joined Anne and me in conversation, as we looked over images, and artifacts, actual pieces removed from the forest (as books always are anyway…) and explored ideas about when anything made ever really ends. I’ll turn our idea session into a Solstenen Artist Profile and add one more layer to how ‘work’ evolves and lives on….when it inspires. Thank you everyone and Anne!